When you think of the world’s deadliest cast, you’d imagine something ferocious like a lion or a tiger. 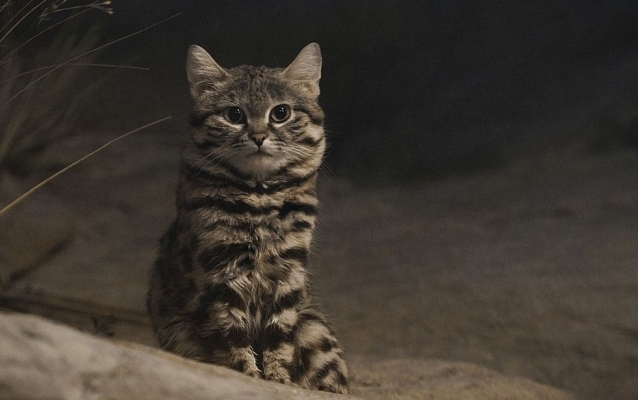 But the world’s deadliest cat is actually the black-footed cat – and it’s the cutest little kitty we’ve ever seen. In a first look clip from the documentary series Big Cats on BBC One, we meet mother cat Gyra as she attacks and kills her prey. But she weighs the same as a bag of sugar and looks like your average domestic tabby cat. Who knew something so cute could be so deadly? The black-footed cat is out hunting for prey every night, and 60% of her hunts are successful – the highest hit rate of any wild cat. 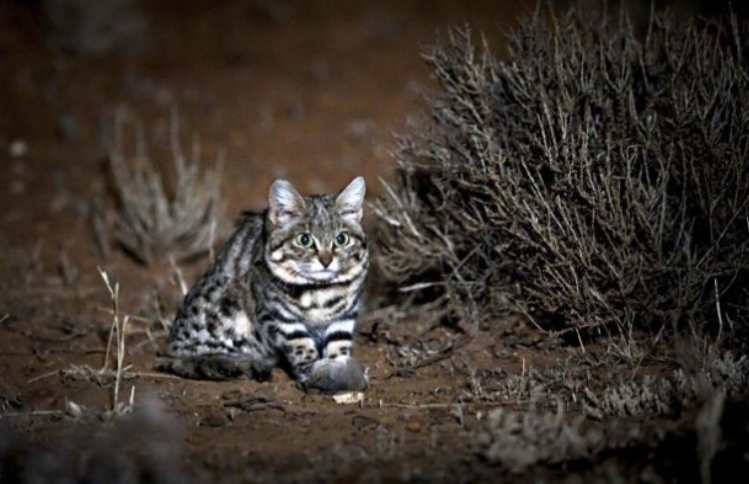 The Big Cats production crew came across the mother and her kitten in the Karoo desert in southern Africa. She’s around 35cm in length and hunts for birds, rodents, scorpions, gerbils – basically, anything that moves – when the sun sets. In this case, a small lark was her night’s victim. Researchers fitted her with a radio-collar and captured the dramatic moment she killed it on camera. Episode producer Paul Williams says: ‘We had seen Gyra hunt various rodents, by stealthily approaching — like a domestic cat hunting in the garden — but we were very surprised the first time we saw her hunt a bird. ‘She slowly crept up behind some scrub, wiggled to get low to the ground and waited. ‘The little spike-heeled lark continued to hop around right in front of her, seemingly not noticing the threat less than half a metre away. ‘After a few minutes the bird got spooked and flew straight up, and much to our surprise, Gyra shot straight up after it. 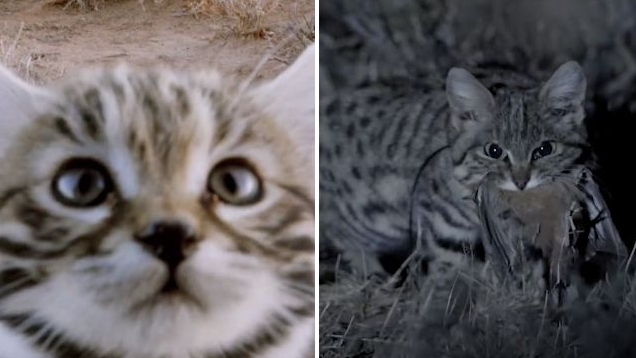 Responses to "The world’s deadliest cat is the cutest little kitty we’ve ever seen"
Highly cute. So scary and so cute at the same time!